My family has always been a museum family. As a child I remember that our outings included trips to museums five times as often as they did shopping or going to the movies. Vacations were filled with visits to aquariums, zoos, local historical archives, and civil war battlefields, where I would stand on the ground hundreds of men had died upon and feel humbled by the immensity of knowledge which sat forever beyond my reach. I grew up in a small town called Ellicott City in Maryland, smack dab in the middle of the Baltimore/Washington Corridor. 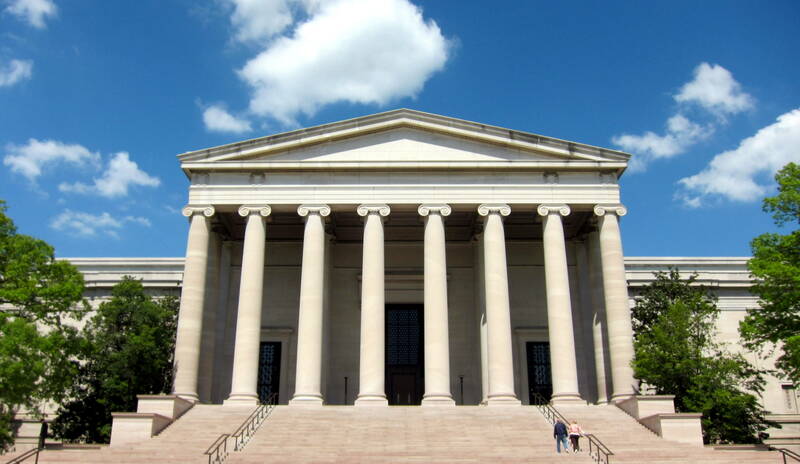 The Smithsonian Museums in D.C. became like second homes to me; I can’t begin to estimate the number of times we visited each site and I can’t describe to you now how much I miss all of them. My sister and I were always allowed souvenirs from these treasure troves. All too often they were cheap, plastic things with the names of the museum stamped in sparkly ink on one side, but every so often one of us would pick up something really good. One of my sister’s acquisitions now hangs on my wall, a gift from a muse to her author. And so I did. And a lifelong addiction to creative writing was born. “Street in Venice” is one of the thousands of paintings John Singer Sargent put on canvas during his long career. 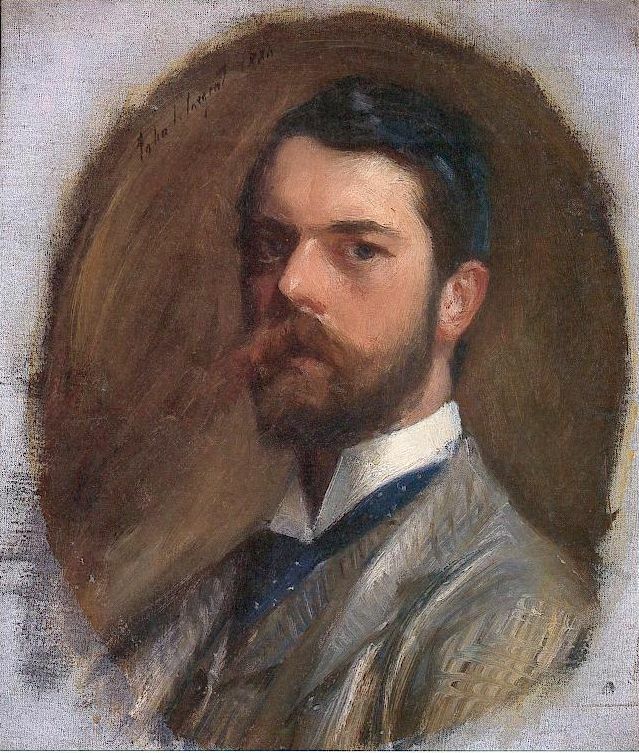 An expatriate American who spent almost all of his life in Europe, John Singer Sargent was best known in his time for his evocative and sometimes scandalous portraits of the elite and aristocratic. He learned from the old masters of portraiture; Rembrandt, Frans Hals, Diego Velázquez. He traveled extensively in both the United States and Europe, painting genre scenes of picaresque sections of cities like Madrid, the countryside of Holland, and Venice. Shortly after making London his permanent home, Sargent visited and worked with Claude Monet at Giverny, where it is thought he first gained his taste for the watercolor medium, impressionistic style, and his desire to paint murals and landscapes. 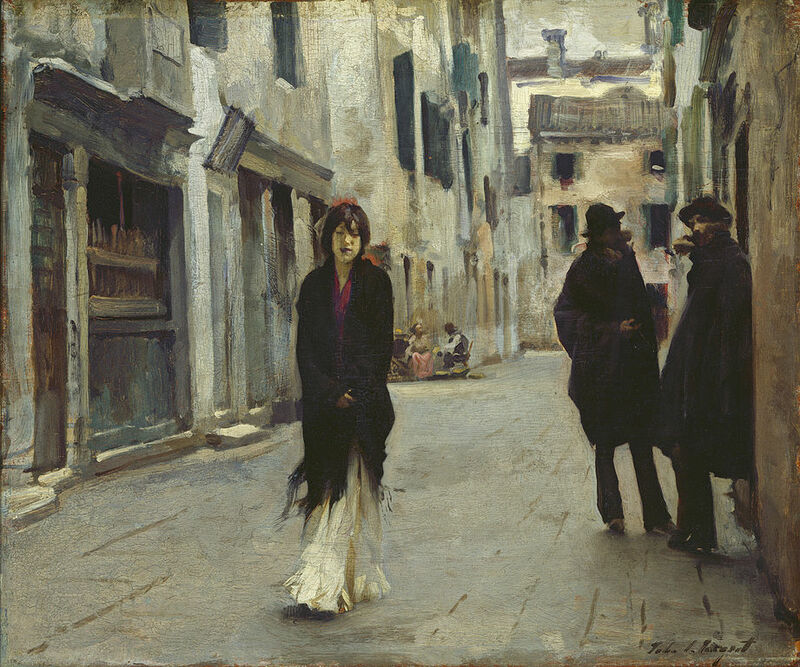 According to the National Gallery of Art, Sargent’s “Street in Venice”, painted in 1882, was done on the spot and in the moment. It shows the inside of a narrow back alley near the Grand Canal, called Calle Larga dei Proverbi, which roughly translates to the ‘wide street of Proverbs’. What truth or lesson Sargent’s scene is supposed to teach is up to the interpretation of the viewer. But for me, the girl with tattered skirts and a ragged wrap, out from under which peeks a bright-colored top, her pinned back hair falling into her eyes: she spoke to me, and she continues speaking, of a hard life lived and a defiance to keep on keeping on. The man in the doorway gazes at her, but she pays him no mind, continuing on her way with a tired expression and a petulant kicking of her hem over the cobbled street. She is alone and she prefers to remain alone, carrying whatever she has to carry under her own power. I feel a kinship to her worn bravado. Chasing a dream is hard work; it’s something you do running on hopes and prayers and very often tears. But I’ve committed, and I’m not looking back or looking for help carrying my burdens. When I succeed, I’ll know that all the long hours, all the loneliness, and all the toil was worth it. I keep the picture in my kitchen. Not the most auspicious setting for it, perhaps, but I enjoy looking at it in the morning after I’ve stumbled out of bed, tired and threadbare, eyes barely open as I arrange my pills for the day on the counter. That woman hasn’t stopped walking once; she knows where she’s going and she’s going to get there. If she can do it, maybe I can to. What about you? What story does the picture suggest to your imagination? Do you have a piece of artwork like this that inspires and motivates you? I’d love to hear about it! This entry was posted in Inspiration and tagged "Street in Venice", Arts, Claude Monet, Diego Velázquez, Essay, Frans Hals, Inspiration, John Singer Sargent, Literary, National Gallery of Art, Non-Fiction, Painting, Robin Jeffrey, Sargent, Smithsonian, Venice, Writing. Bookmark the permalink. I remember being greatly inspired by the works of John William Waterhouse. Even though he often painted women from the realm of fantasy and mythology, he always gave them expressions that seemed very real to me. His women talked with each other, listened to music or verse, and remembered lost loves while seeking out new adventures.